Water to Heat Pump + Fan Coil + Radiant Floor Schematic - Shine Energy Systems Inc. 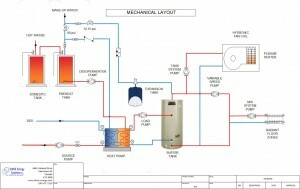 This particular posting is a reference drawing on a typical plumbing layout for a water to water heat pump, hydronic fan coil, radiant floor, and domestic hot water support. – the domestic hot water can be a zone off the initial load plumbing as it runs through a heat exchanger. A pump would be required on either side of the heat exchanger. – you may only have one hot water tank, in which the primary source of heat may/may not do most of the work and the heat pump adds little support. – you may not have multiple pumps, but just one pump and a combination number of zone valves opening to their zones. – your supply/return for each zone may be different. 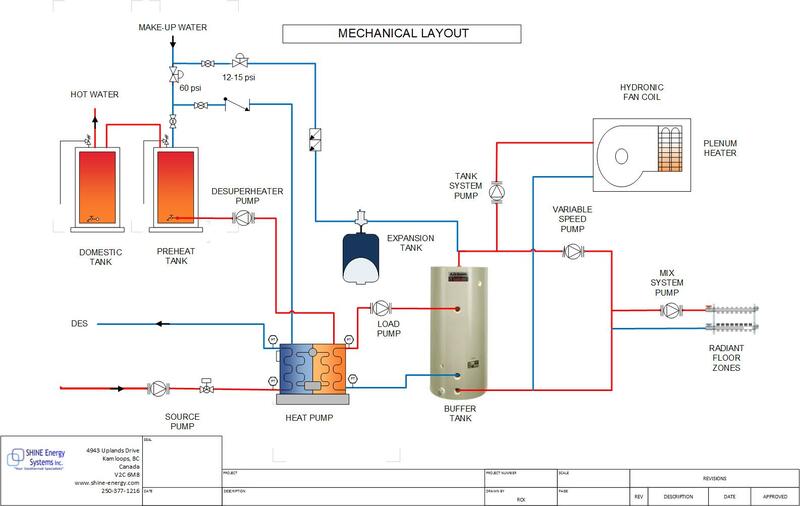 A common water to water heat pump layout for a DES system.